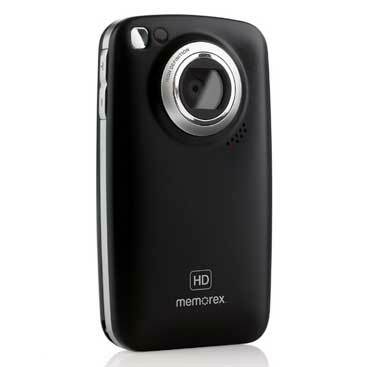 Memorex’s MCC225 MyVideo HD pocket camcorder records 720p high-definition footage, snaps 5-megapixel still photos, and has a retractable USB connector, like most of its pocket-camcorder competition. For a fairly low price, it offers decent-quality 720p footage in bright light, as well as a few features we’ve seen only on pocket camcorders that cost at least $50 more. The MyVideo offers your average specs for a pocket camcorder: 4GB of internal storage (which translates to 2 hours of 720p footage), a 2-inch-diagonal display, a lithium ion battery you can recharge by plugging the camera into a USB port, and dead-simple operation. The higher-end features are its digital image stabilization, a macro/landscape toggle, an HDMI-out port (cable included! ), and surprisingly good 5-megapixel still photos in brightly-lit settings. The MyVideo HD captures relatively sharp and colorful photos, comparing favorably with the output of most camera phones. On the other hand, its digital image stabilization system didn’t provide any noticeable evidence of curing camera shake; I’ve yet to see such stabilization on a pocket camcorder that truly does the trick. The MyVideo also has a 3X digital zoom, but hands-on tests with that function resulted in extremely choppy, potentially movie-ruining footage. My advice would be to avoid using the zoom with this camcorder. Apart from the new Flip MinoHD ( ), which has a supersmooth zoom, the vast majority of pocket camcorders have unusable digital zooms (although this may be a blessing in disguise). While it didn’t rival the video quality of competing camcorders such as the 1080p-shooting Kodak Zi8 ( ) and the 720p Flip MinoHD, the MyVideo captured good video in well-lit settings. In my informal tests, the MyVideo lagged for about a second or so when adjusting to backlit settings and dramatic lighting changes. Colors were a bit muted and washed out, white balance was a little dark, and the video looked more “digital” than the top-ranked competition. All in all, it shot decent but unremarkable footage. Audio recording is about average for a pocket camcorder, and a bit hollow-sounding. Design-wise, the MyVideo is plain but easy to use. The 2-inch LCD on the back resides over two touch-sensitive divots (for playback and delete controls) and a four-way directional pad used to navigate menus and operate the zoom. A big button in the center of the directional pad handles recording. Menus were well-organized and clear, and the buttons were responsive. The top of the camera hosts the macro/landscape toggle (macro mode works well as long as you’re a couple of inches from the subject), while the sides hold the volume controls, power switch, A/V out port, and USB connector release button. On the bottom of the camera are the tripod mount and the HDMI port—a full-size HDMI connection, rather than the mini-HDMI connectors we’ve seen on other pocket camcorders. The USB connector also pops out of the bottom of the camera like a spring-loaded out-the-front automatic knife, and it feels sturdy enough to withstand a good amount of plugging-and-unplugging action. The MyVideo body itself, however, is a bit cheap and plasticky, and it definitely won’t win many fashion awards. What’s more, when you have to remove the rechargeable lithium ion battery from the MyVideo, the front panel is tricky to remove. The included ArcSoft MediaImpression 2 software, which installs on your computer (Mac, Windows XP, and Window Vista compatible) when you connect the device for the first time, is another nice surprise. It supports directly uploading clips to Facebook, YouTube, or Vimeo, but it also has a basic video editor that lets you sequence clips and add transitions. The MyVideo is purely a budget buy, but a solid one. Its looks and build quality may not be something you can fall in love with, but it shoots good enough video in bright light to make it a decent value for the $130 price, and it might be a good stocking stuffer for that aspiring elementary-school filmmaker in your family. But compared with the rest of the HD pocket camcorder class, it’s an average performer.